In 1954 the foundation was laid for a company which has proven to be successful in designing innovative oven-technology. 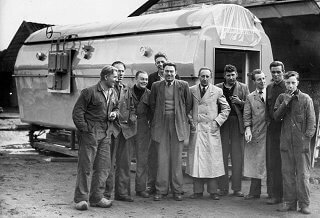 The first Van Dijk oven was built for a company in The Hague called Van der Heem and was designed by the founder of the company, the late Gerrit van Dijk. The oven was used for the so called enameling (drying and hardening) of lacquer on vacuum cleaner casings. The oven made use of racks, which were pulled through the oven at a certain interval. These racks formed the bottom, the beginning and the end of the oven. It was a revolutionary oven, because it made use of circulating hot air, which went between the products. This way energy costs and time needed for the enameling were halved. During the entire history of this oven building company we will see progressive and energy-saving designs. The second half of the fifties we see the development of the tunnel-rack oven. 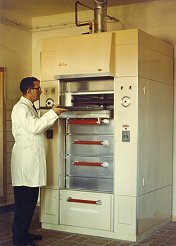 This was an oven especially designed for industrial bakeries and confectioneries.In 1960 Van Dijk settled in Tilburg, the Netherlands. In the early sixties natural gas became more and more common as an energy source for domestic heating and industrial purposes. As a result, many bakeries had to switch from fuel-gas (or even wood or oil) to natural gas. 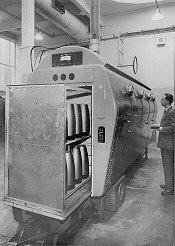 This has been very important for the company, as it prompted the development of the quite innovative Dijko confectionery oven, by request of a number of confectioners.In the course of years the Dijko oven has become increasingly popular, so that now almost one third of all confectioneries in the Netherlands are using a Dijko oven in their bakery. The savings in energy and labour were so spectacular, that the oven was usually earned back in only three years time. After several improvements in the following years, this oven is still in production today. Derivations have been designed in the form of rack-ovens, where a rack is driven in and out of the oven. This way the manual labour was lightened even more.The current owner, Peter van Dijk, joined the company in 1973. In 1982 the first computer-controlled oven was built and shown at the bakery exhibition in Brussels. With this, Dijko signaled the beginning of a development of far-reaching automation and the application of electronic controls in the world of bakery. With the new control it was possible to store 40 programs for baking various products. After typing in the appropriate code the oven automatically set the right temperature, baking time, steaming time, etc. Nowadays we find these kind of controls quite normal and we can find them on various appliances, like microwave ovens and coffee machines.Because there was an increase in the export of ovens to countries all over the world, we were looking for a way of building prefab in the Netherlands, shipping and using a minimum of time setting up a complete oven-line at the site. In 1983 the so called modular system was invented. Parts of the bakery production line were built in a number of modules of equal length (the length of a bakery rack). In Tilburg these modules were fitted with all components, tested and made ready for transport. Because no time had to be spent on wiring, testing and so on, the time needed for setting up could be limited to a few days or a week. Especially the client appreciated this short time needed for setting up. The faster the new oven line is set up, the earlier the client can resume his production. For Dijko it reduced costs of mechanics in foreign countries.In 1984 the current company, Dijko Ovens BV, was founded.Parallel to the development of bakery ovens runs the development of industrial ovens. Dijko is mainly known for the development of special ovens which are used in a number of well-established companies in The Netherlands. This specialistic knowledge is beneficial for improving bakery ovens.Dijko is a good partner in conversation when a special oven needs to be designed. Further on we will see a clear example of this with the development of the special wood-curing oven for Plato. In 2007, the third generation, Jasper van Dijk, joined the company.